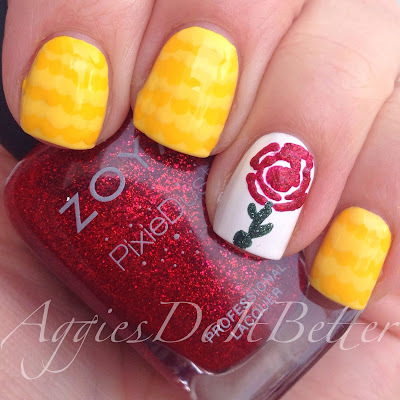 Aggies Do It Better: Princess Week-Beauty and the Beast Belle-Inspired Nails plus tutorial! Princess Week-Beauty and the Beast Belle-Inspired Nails plus tutorial! Next up in my week of Disney Princesses is Belle! Originally I was going to use my craft scissors and cut out tape with a scalloped edge and use 2 different yellows to represent her dress. But, I haven't had a whole lot of time lately and whenever I use tape I'm so paranoid that I wait several hours before I tape and paint again. So, I tried to figure out a way to mimick what I had in my head with out tape. The answer? DOTS! WHOOP! Guys, these are super simple. 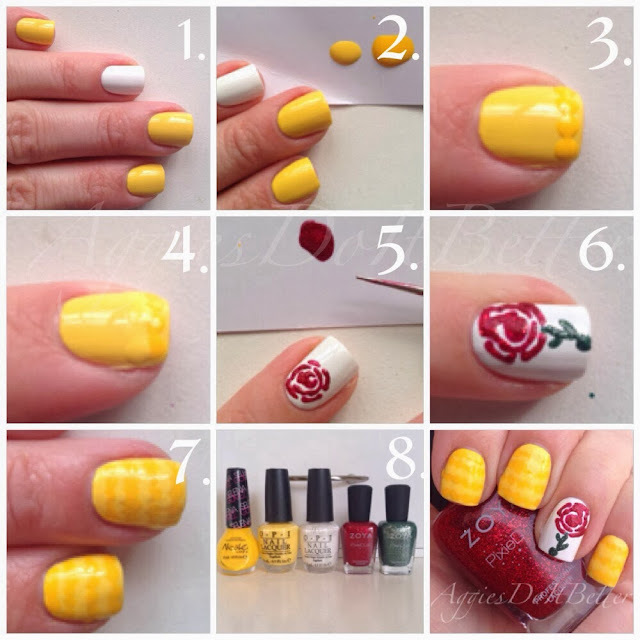 All you need is 2 different shades of yellow! 1. Start with 3 yellow nails and one white. I used the new OPI I Just Can't Cope-acabana, I swear it's my new go to yellow! Let's call this the "base yellow." 2. Dab some of each yellow on a separate sheet of paper. I like to use glossy type paper (think post card or junk mail) so the paper doesn't absorb the polish. 3. 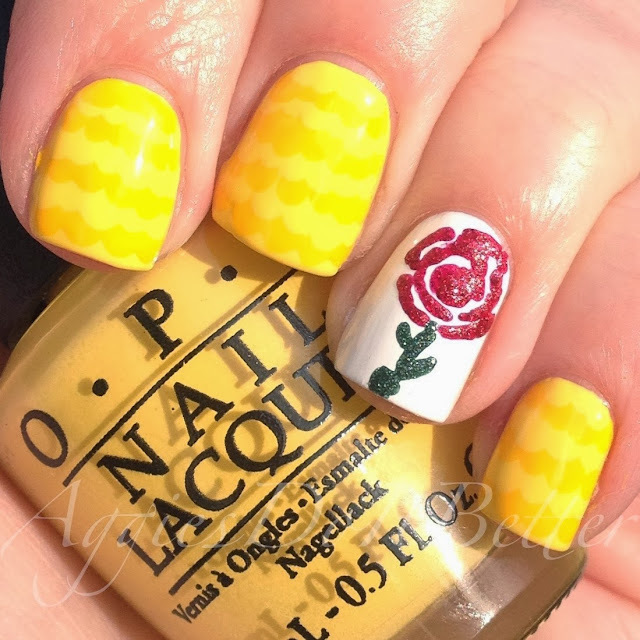 With a dotting tool or a toothpick, or back end of a needle or whatever , make a row of dots at the end of your nail of the darker yellow (accent yellow). You want them just touching but not overlapping. 4. Let the first row just set, but not totally dry. Make a second row of dots with the base yellow, touching but not overlapping, just above. Here's the thing. You want your ROWS of dots to slightly overlap, but not the dots within the rows themselves. Make sense? We're going for scalloped edge to mimick her dress, not polka dots. 5. While I'm letting each row set just a bit I worked on my flower. DON'T LAUGH I know it's special. I used my red and green pixiedusts for it, but you could certainly use cremes. I used a small dotting tool to kinda drag lines into curves. 6. Use green to add a stem. One that looks better than mine. 7. When you have gone all the way up your nail with rows, let it dry just a bit. Then, add topcoat. A lot of times I don't add topcoat to my designs, but for this I think it really helps blend the ruffles. In this section the top finger does not have top coat and the bottom one does. Polishes used: NOPI Hit the lights (accent yellow), OPI I Just Can't Cope-acabana (base yellow), OPI Alpine snow, Zoya Chyna and Chita. Princess Week-Ariel inspired nails plus tutorial! Princess Week-Snow White Nails plus tutorial! Love owls for Valentine's Day! Olympic Colorblock Nails with Zoya Pixiedust!